Kamon is inspired by the combination of bicycle wheels and the Japanese emblem called Kamon which is used to decorate and identify a family. Most Kamon consist of a roundel encircling a figure of a plant, animal, or objects which are man-made, natural or celestial, all abstracted to various degrees. Different types of bicycle wheels have been redesigned schematically like the typical encircling figure of a Kamon. 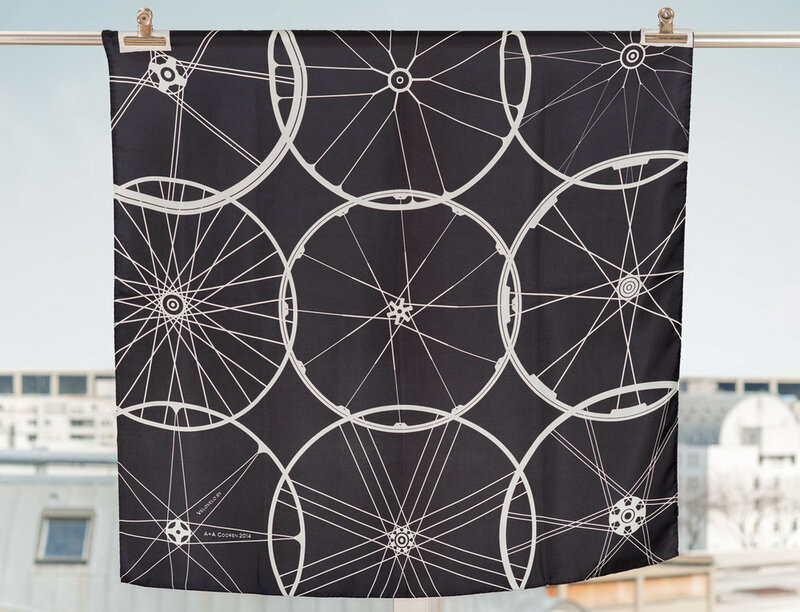 We chose to work with the bicycle wheel from its graphical and representative image, exploring the varying ways that the spokes are connected. Exhibition VéloVelo is a collective exhibition held in Milan and Paris with 25 designers, inspired by a playful combination of the French word for bicycle: vélo, and the Italian word for foulard: velo, curated by Marie de Cossette & Francesca Montà.